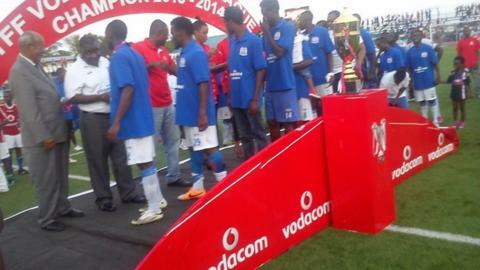 After winning the Tanzanian league without losing a match, the newly-crowned champions Azam FC say their next target is to win a continental title. The club, which is owned by billionaire industrialist Salim Bakhresa, ended the dominance of Simba and Yanga - who have been alternating champions since 200 - to win their maiden title. The club's managing director and heir apparent Yusuph Bakhresa said preparations for their Champions League debut were now going to start in earnest. "We are going to play at least three top friendly games before starting our champions league campaign," Bhakresa told BBC Sport. "We have also started a process to sign three world class players, we have to start strongly and show Africa that there is another serious club called Azam," he added. "We want to reach far, we want to be like TP Mazembe, it will be a revolution in Tanzanian football." Azam is the richest club in Tanzania with a total investment portfolio of over $10m, complete with a stadium of their own and a TV station. Bakhresa revealed there is more investment to come: "Soon we will unveil a sponsor, it is a local company, we have already agreed but I can't give details, but it is a deal done." Owing to their financial muscle, players from across the region and beyond have been attracted by the ice-cream makers. One such players is Ugandan talisman Brian Omwony, who says Azam is incomparable. "This is a professional club, very organised with good players," he told BBC Sport. "They treat me very well here, I have been elsewhere in South Africa, in the United States, in Vietnam and Uganda but here it is exceptional, I am very happy with what I am being offered." Other prominent foreign recruits include the Ivorian pair of Kipre Tchetche and Kipre Balou as well as a coach from Cameroon, Joseph Marius Omog. Azam brought in Omog from AC Leopards of Democratic Republic of Congo, appointing him as the replacement for Englishman Stewart Hall. The club, who are locally known as Matajiri wa Tanzania - Swahili for the rich spenders of Tanzania - finished the league with 62 points, six ahead of the runners-up Yanga. Azam was founded in 2007 and enjoy massive financial backing from its owner, Salim Bakhresa, an industrialist who was recently ranked by Forbes magazine as one of the top three richest men in Tanzania. They participated in the Confederation Cup competitions this year but failed to go past the first round.